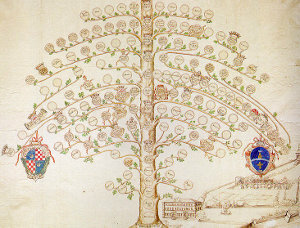 If you search your ancestors in Menfi, Sicilia, info about your Italian family are stored in the City Office archives or at the parishes. In towns and villages of Sicilia and in Agrigento province registry offices were established around 1820: it means that you could find information in Menfi registrar as of that date. So, if your ancestors were in Menfi in the nineteenth or twentieth century, then you could try to contact the City Office of Menfi to know more. Before to start your genealogy research in Menfi, we suggest you to read our tips for your search . They are useful to search in sicilia and in Menfi too. 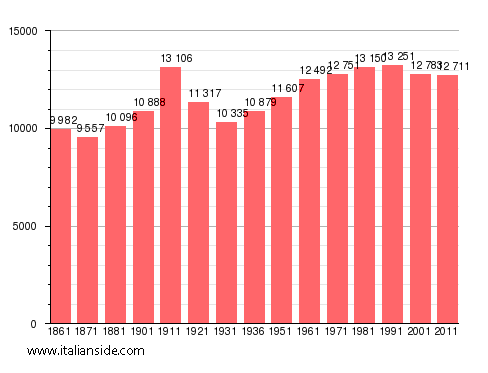 Next picture shows the demographic trends in Menfi from the Italian Unification (1861) an important info to understand how many people lived there in the past. It could be important to know if the last name you are investigating is a frequent surname in Menfi. As more your surname is common in Menfi, as more it could be difficult to find the right info about your ancestors in Menfi archives if you have not exact dates. If you have the opportunity to visit Menfi and Agrigento province, you could plan to investigate churches’ archives by yourself (or with us! ), but from abroad is very difficult to obtain any result unless you find a reliable local help. If you have the opportunity to visit Menfi and Agrigento province, you could plan to investigate churches’ archives by yourself, but from abroad is very difficult to obtain any result unless you find a reliable local help. If your research is in a dead end and you need professional help from our local Italian genealogists write to menfi@italianside.com our expert in Menfi area will study your request and will reply to you with a research plan and a quote. I AM SEARCHING FOR INFORMATION ON PAOLO DOMENICHO SOSTINE DI GAVINO OR PAOLO GIVINO BORN IN MENFI IN 1844 AND EMIGRATED TO ENGLAND WHERE HE BECAME NATURALISED. HE MARRIED ELLEN AMELIA CLEAVER IN 1872 AND HAD 10 CHILDREN…. ANY INFORMATION WOULD BE MOST WELCOME. I am looking for information for my great-grandfather, Antonino (Antonio) Giaramito (possibly spelled Giaramita), born 1861, and his wife Rosa Giaramita. I believe she was also from Menfi. I am looking for their birth certificates and marriage certificate. They left Sicily for the U.S. in 1900. I am looking for a birth certificate for Vincent (Vincenzo) Modica said to be born in Menfi 13 December 1867. Sto cercando un certificato di nascita di Vincent (Vincenzo) Modica ha detto di essere nato a Menfi 13 dicembre 1867. The family name I am researching is Buschier, Buschieri, etc. The full name is Dominic Buschieri in the 16th century. My name is James. I am also a descendent of Dominic Buschier. I was wondering if you ever received a real back or have you you discovered any new information about Dominic that suggests that he was from Sicily? If so, I would greatly appreciate any you could provide. I also am trying to find out more information on Dominic Buschier (Buscemi) . Although I have seen that his name may have been Buscemi (and that he changed it to Buschier when he moved to France) – I don’t know how reliable that information is. However I did see his name in a list of French Huguenot surnames in a list from the National Huguenot Society. This would make sense as there were a number of French Huguenots who immigrated to England around that time due to persecution. Searching for Salvatore cusumano who was born in menifi in 1880 and emigrated to usa in 1898. He married rose cacioppo from sambucca in in the USA in 1901. If you would like to start a research in Menfi please send your request to menfi@italianside.com.